Woody Harrelson's Parenting Advice for Owen Wilson | Breezy Mama Breezy Mama - Expert parenting advice, celebrity interviews, product reviews for kids, moms and babies and more! With Director Jimmy Hayward and Woody Harrelson. By now, you’ve likely heard that Owen Wilson will soon be a father for the second time (son Ford with his ex Jade Duell is 2 1/2) after it was announced his married personal trainer is expecting his child. 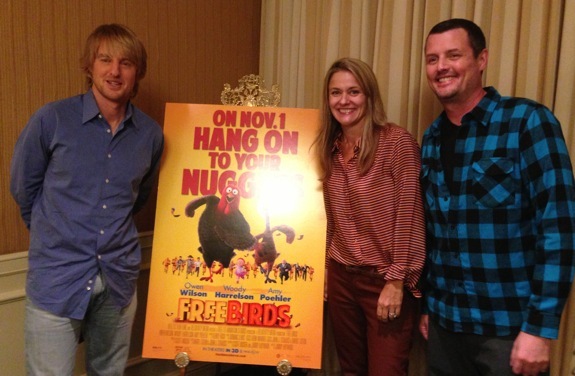 When Breezy Mama sat down with Woody Harrelson and Owen Wilson for a round table press interview with other “mom” bloggers, it was interesting to hear what the two stars of the upcoming children’s movie Free Birds had to say about being dads, working on the movie together, whether they read “mom” blogs (yes, Breezy Mama had to ask) and more. In fact, I might just have to say it was the most hilarious celebrity interview I have been a part of to date with these two comedians… here’s what went down. Do you guys have a favorite mom blog? Owen Wilson: Favorite mom blog? Woody Harrelson: This one. I know that answer. I was wondering what kinds of dads you guys are. Are you fun guys? Owen Wilson: Did you ever see The Great Santini? Woody Harrelson: You’re a strict disciplinarian. Owen Wilson: Well, they say that the number one thing is to be consistent, and I guess I try to do that a little bit. But, I actually remember [Woody] saying that a big thing, right before Ford was born is just to hug your kids a lot, and I do do that, which comes very easily because he’s very huggable. And so, it sounds corny, but you can’t hug your kids enough or give them that confidence that they’re loved. 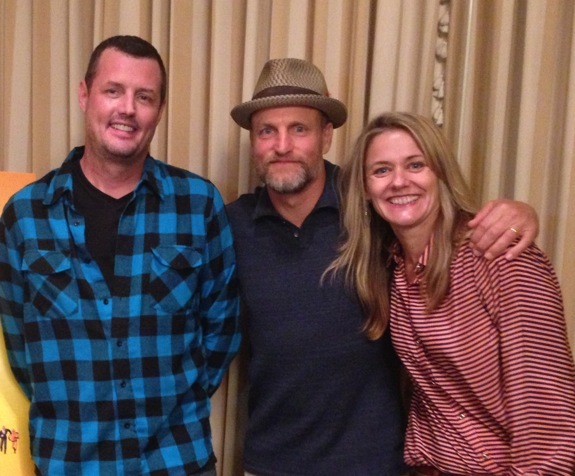 Woody Harrelson: That was great. I swear I’m welling up on this. It’s beautiful. Is there a dad fail you’d like to share with us? Woody Harrelson: You guys have all your terms, I bet. Dad fail. Do you have a mom fail, too, or is it just dad fail? Yes! It started with mom fails! Owen Wilson: I take after my dad a little bit. My dad was not mechanical and I don’t have that ability to read directions and then put stuff together. I remember my dad with the toaster, he couldn’t even figure out how to turn that off. He’d just have to unplug it. He could never work the thing, so just pull the plug out. What about you for dad fails, Woody? Owen Wilson: –Are they really going to do the whole play of Hamlet? Woody Harrelson: No, no, they’re not doing the whole thing. Woody Harrelson: They’re going to edit that down. Owen Wilson: Edit it down. Woody Harrelson: I think even Shakespeare probably now would be like, sure, edit it down. So, you can’t go see the play? Owen Wilson: So, it sounds like this example you were supposed to give of a dad fail is really going to be a dad victory, and now like they’re like, oh, geez. Woody Harrelson: Thanks for noticing, by the way. Owen Wilson: Yes. I think I’m going to be able to do it. Have any of your kids seen the movie yet? Owen Wilson: —So, she was a quick study. Woody Harrelson: Yes, she got to eat that night. Owen Wilson: I did one of the talk shows the other day, so they sent some clips over, and I showed them to Ford, who’s almost three. And, bless his heart, but he just loved it. He thought it was the funniest thing he’d ever seen. Did he specifically react to her voice? Owen Wilson: He was like dada. [Joking] When were you going to tell me about this? What the heck? You’re just keeping this to yourself? Hang onto your nuggets. Come on. Woody, your voice was maybe hard to recognize, but we knew it was you. Owen Wilson: And mine was pretty hard to recognize, too. Woody Harrelson: -Yes, I got into character. I came to work in feathers with my waddle and I was ready to go. I thought, I’m going to be funny tomorrow. Unfortunately, today, it’s not going to happen, I see. You two are so funny! Did you goof off a lot while working together? Owen Wilson: Now that [Director] Jimmy’s [Hayword] left the room, I can say that I felt like it was like algebra class, and we had a teacher that was immune to our charm. Woody Harrelson: We’d laugh at what the other guy did and think it was hysterical. Owen Wilson: Oh, we were our own best audience. Owen Wilson: Yes, just swatted. You mentioned laughing a lot during it. Was there a particular scene you remember that really got you going when you were shooting? Owen Wilson: Yes, that was making me laugh. But, also, because we’re not working together, so you’d come in and you’d see kind of, ooh, what little Bon Mot has Woody come up with or Amy [Poehler]. And you’d hear them, and you’d kind of get inspired or revved up to try to at least be on the same level. Woody Harrelson: Oh, please. I remember the first time we came in, this is one of the only two times we did it together and I’d come in like all hung over and unprepared, and he comes in with all these ideas and notes and concepts and just nails it. And I was terrible. It was horrible. Owen Wilson: It’s five o’clock somewhere isn’t it? Woody Harrelson: Is this going to keep going? Owen Wilson: Is it time for a frosty? Woody Harrelson: I thought we’d say a few lines and go home. But, no, I remember hearing that line he said, I don’t want to toot my own horn, but toot-toot. Woody Harrelson: That made me laugh. It was a good process. Have you ever been somewhere where a kid recognizes your voice or they have a reaction to–? Owen Wilson: –What happens more often is that a parent comes up and says that their kid loves Cars and then says, this is Lightning McQueen, and then the kid just stares at me. And then, the parent wants a picture and the kid doesn’t want a picture, and I’m having to smile and corral this poor little kid into a picture with this lunatic that, as far as he’s concerned, is saying he’s Lightning McQueen. Woody Harrelson: That doesn’t look like a car. Owen Wilson: Yes, that doesn’t look like a car. You both have young children. Do they make the connection? Owen Wilson: No, with the Lightning McQueen, I think it’s because his mom has told him so many times, oh, that’s daddy’s voice, it’s almost by rote that you’ll ask for who’s Lightning McQueen, daddy’s voice. I don’t think that’s who he really thinks Lightning McQueen is because it’s a car to him. Do you prefer voice over or do you like acting of all the roles that you did? Owen Wilson: I prefer the voice stuff because, well, I’m trying to think of a word that sound better than easier. Woody Harrelson: None more accurate. Owen Wilson: You don’t worry about wardrobe or kind of people coming over with hair and makeup and stuff, and you just go in and kind of make believe. So, yes, I like doing animated stuff. Woody Harrelson: Yes, love, love, love it. I have only done one. Woody Harrelson: Thanks, everybody. I’ve got to get hip to the mom blogs. I guess I didn’t think it applied, but now that I know you’ve got the daddy fail thing going. You have the best job. Ha Kathy! It was a lot of fun! Ha! Love it, Alex. BTW – my kids are STILL talking about hearing his voice when they saw him at the premiere! I wanted to tell him that THEY care -lol! I am really sorry … I am having a hard time getting past the headline. Owen Wilson is having a baby with his married personal trainer. And everyone is ok with this? I think it’s sorted and disgusting. I am pro gay marriage. This is the type of behavior that gives marriage a bad name.